I recently watched Dennis Wise's "The Greatest Story Never Told", a six-hour documentary on Adolf Hitler and the Third Reich. This is a video that tells the story from a perspective that is not unsympathetic to Hitler and his movement, and describes a great many historical events in support of Hitler which are verifiable yet stricken from "politically correct" history. I won't go so far as to suggest Hitler was a hero, assuming the majority of the reports from the film are true. As a libertarian, I categorically deny the initiation of force for political ends, and refuse to condone persons or entities that initiate force. However, the character of Hitler becomes much more understandable when not viewed through the standard "Hitler = Satan" lens. Even when I assumed all of the standard "Demon Hitler" stories to be true, it was clear to me that the Allies were worse. Stalin alone murdered an order of magnitude more innocents than did the Reich, even assuming the larger death estimates from the Holocaust. It is now not disputable that the Allies were the first to target civilian cities for complete destruction, and the only powers to use nuclear weapons. It is also now known that the Axis repeatedly attempted peace treaties with Britain which Churchill repeatedly scorned to the detriment of Britain. If there were "good guys" and "bad guys" in World War 2, then the "bad guys" won. In this context, it's a bit easier to be open to Hitler as not entirely evil, but rather a case of the road to Hell being paved with good intentions. The documentary is not as objective as it likes to claim, but nevertheless provides pieces of the Hitler puzzle which change the overall picture in startling and important ways. He was not entirely a power-mad conqueror in this context, but a man who sought to re-elevate the German peoples from their decline since WW1 and stem what he saw as an existential threat from Communism and its (in his mind) Jewish instigators. Of course, the world would still have been better without him (and all who insist that the solution to human problems is force). Libertarian: Pallas sextile Sun and semisquare Venus, ruler of the Sun. The Sun is trine the Moon, ruler of Pallas. Authoritarian: Pallas opposite Jupiter, quindecile South Node, ruled by Moon (which is quincunx Pluto and conjunct/parallel South Node). This is a mixed signature, with the authoritarian side probably stronger to begin with and with a likelihood of gradually overtaking the libertarian aspects over time. Nevertheless, the "libertarian" aspects may account for his repeated peace overtures to the West, his (compared to Stalin) relatively humane treatment of captured territories (by some reports, anyway), and his leadership of the most racially-integrated military force of the time (the Waffen SS, boasting of very significant numbers of volunteers from Islamic nations). Capitalist: Pluto (co-ruler of 2nd House), novile and parallel North Node. Collectivist: Venus is trine South Node; Mars co-rules his 2nd House and is trine South Node; Pluto (co-ruler of 2nd House) is conjunct Neptune. As we would expect from a Socialist, the "collectivist" indicators are quite a bit stronger than the "capitalist" ones. Conservative: North Node, elevated, in Cancer. Fourth House co-ruled by Uranus which is square the Nodes. Liberal: Moon conjunct and parallel South Node. Saturn, ruler of the Moon and co-ruler of the Fourth House, is quincunx the South Node and quintile Neptune. Many "mixed signatures" for culture lean to the Left. Hitler was actually both "liberal" and "conservative": he elevated nationality and race as would a "conservative", but created structures which weakened the traditional family in favor of the State, as would a "liberal". 1. Pallas opposite Jupiter, quindecile South Node, ruled by Moon (which is quincunx Pluto and conjunct/parallel South Node). 2. 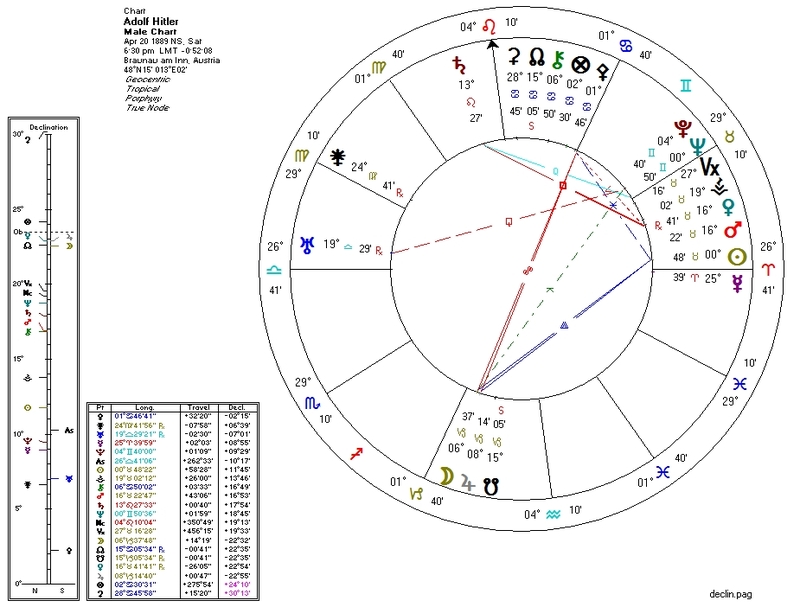 Venus is trine South Node; Mars co-rules his 2nd House and is trine South Node; Pluto (co-ruler of 2nd House) is conjunct Neptune. 3. Venus (ruling the Sun) at the midpoint of Sun and Pluto. 5. Venus (ruling the Sun) at the midpoint of Sun and Pluto. Of course, the film's assertion that National Socialism was an "economic miracle" is idiotic. The "miracle" almost certainly came from breaking the economy-killing Versailles Treaty. The Socialism part of Nazism would have eventually resulted in economic depression, massive shortages of goods, and significant inflation -- all socialist systems eventually do. These inevitable failures would have re-opened the door to the forces Hitler dedicated his career to getting rid of. Communism was not going to die until it proved its own falsehood by collapsing on its own. Regarding Judaism in the film: communism and the counter-cultural trends Hitler hated so much were not strictly a Jewish phenomenon (Neptune isn't specifically Jewish) but the film does not acknowledge this. The film also presents arguments for "holocaust-denial". I do not support this view but am yet not aware of a full refutation of it. Hitler might have gotten further and lived longer had he stopped with the breaking of the Versailles Treaty and the consensual annexation of Austria. If indeed there was persecution of Germans in Poland, he should have taken the route Putin is taking now: sending aid and directly protecting only regions which formally break away. The moment he took to the use of force, he gave the Allies an excuse to attack, and sealed the fate of his movement.